One Night Ultimate Werewolf: Daybreak is a fast game for 3-7 players in which everyone gets a hidden role, each with a special ability. (No plain "villagers" here!) In the course of a single morning, your village will decide who among them is a werewolf...because all it takes is finding one werewolf to win! It’s Saturday Night at the Paladin’s Love Shack and we’ve got guests over for a party. The Lady went and invited one-too-many people, or two-too-many or even three-too-many, and now we can’t play any six-player board games. What’s a gamer with a gaming itch to do? Oh, wait! Good thing I love hidden role games! There’s no question that The Resistance has become the favorite Mafia-style game of accusing and murdering your friends, thanks to its no player elimination mechanics and short play time. But more and more hidden role games keep popping up lately, from Bang! to Moriarty’s Machinations to Mascarade. True party games, these can sometimes accommodate ten or twelve players, ensuring that nobody has to sit it out or watch from the sidelines — unless the game’s mechanics include the dreaded elimination. But despite all the really cool themes and innovations out there, something just feels visceral and perfect and classic about playing a good game of Werewolf, despite the fact that, about five minutes into the game, someone is immediately lynched and eliminated. But wait — I can play Werewolf in a single round, with no eliminations? Yes, you can. We all can. The game is called One Night Ultimate Werewolf and it has a sister game slash expansion, called Daybreak. In One Night, players go through one round of actions to gain clues about each others’ roles, and then there is a single “Who’s the Werewolf?” discussion followed by an execution. If a werewolf is killed, the villagers win. If a villager is killed, the werewolves win. It takes about ten minutes — longer if you’re silly and set the app to allow each player 30 seconds for their action. No, seriously. Don’t do this. 15 seconds is plenty. Much like the seer or hunter or child in classic werewolf, nearly a dozen different characters with special abilities are tucked into this portable box. Each is beautifully illustrated in a cartoon style that really pops, and printed on heavy, sturdy card stock for easy and silent manipulation of character cards when other players have their eyes closed. Included are a few other tokens, like a shield to designate who the sentinel defends or artifacts that the curator randomly drops on a card, for no reason other than laughs and “because it’s funny”. Werewolves get to recognize each other, as usual. The Alpha Wolf, if there is one, can turn another player into a werewolf — to his detriment mechanically, so I have no idea why. Other roles allow you to look at cards, trade cards, protect or sabotage cards, and a variety of actions that, ultimately, give you very little information about your opponents or the location of the werewolves except by an incredible stroke of luck. Oh, and you’re playing with the village idiot role? He goes last, and shifts everyone’s card except his own one place to the left or right. So any investigating you did could very well be for naught. One Night Ultimate Werewolf: Daybreak gave us a lot of laughs for the two short rounds we played. Half the laughter was at the ridiculous background “music” selected for round two, which was howling, snarling, angry wolves that drowned out the narrator in the app. Oops, guess I should have tested it first! But other than the laughs, it delivered only confusion and chaos for my group. When the time came to argue over who to execute, the most normally-vocal players were silent and dumbstruck. So, should you try or buy this game? When you consider that there’s no information gathering at all in the classic Werewolf party game, I will cheerfully agree that this is a step forward. It shakes up the roles and even werewolves won’t know if they’re actually a werewolf, when it comes time to string someone up. But with so many other options out there these days offering a hidden role experience that allows for deduction and coercion, a game where you roll the dice, cross your fingers, and hope you’ve just ganked a werewolf has no place. Much like Cards Against Humanity or the upcoming, obnoxious Exploding Kittens, I’ll classify this as more of a novelty than a game. Break it out when you want some laughs, and put it away after a round or two of mind-boggling random finger pointing. Light hidden role & “deduction”, classic party game. Not recommended — skip it and grab Bang! Dice instead. 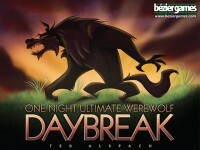 Add a Review for "One Night Ultimate Werewolf: Daybreak"